The Venturi Eclectic, currently on display at the Paris Motor Show, is powered by a 22hp, 50Nm electric motor that's charged by the 2.5 square meters of solar panels on its roof. If it's too cloudy out, a wind-powered force wheel generates the electricity, and in a pinch you can rehcarge using AC power. 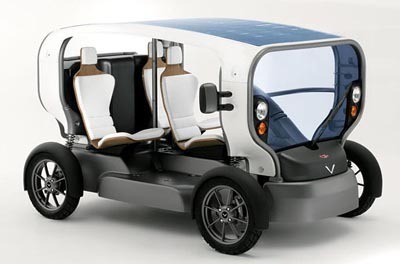 Designed for urban driving, the golf-cart styled vehicle can reach a top speed of 32mph. It goes into production next summer and will sell for 24,000 euros. Dang. That's a $30,500 golf cart. A $30,500 golf cart that doesn't have doors and tops out at 32 miles per hour. Yeah, you would need to get some reasonably wide spread use and then the price would come done. Rarely is any new technology cheap. Still, I thought the concept was fun.